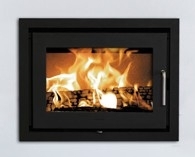 Want to continue burning wood in your exisitning fireplace, but want real heat and low emissions? Then it’s time for a wood burning insert. EPA certified Fireplace inserts let you turn your dirty, sooty, inefficient wood burning fireplace into an efficient and beautiful source of heat, creating less ash while using a lot less wood. With a wide selection of tradional and modern styles in a variety of sizes, you are sure to find the right insert for your home at Pacific Energy Company. Jotul of Norway, a Norwegian corporation, is the world’s oldest and largest producer of cast-iron heaters in the world. Jotul set’s the standard for quality of materials and workmanship for all other hearth product manufacturers. Jotul cast iron wood inserts will bring both beauty and warmth to any room where once there was a wood burning fireplace. 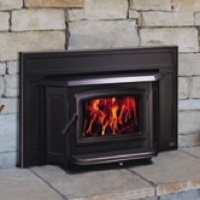 With three different styles to choose from – the C350 Winterport, C450 Kennebec and the C550 Rockland, there is a Jotul wood burning fireplace insert to fit your needs. Pacific Energy Ltd wood burning fireplace inserts are easy to light, easy to use, economical, clean burning and beautiful to look at.. With three sizes & seven styles to choose from – the Vista, Neo, Super, Summit and Alderlea – Pacific Energy has a solution & style to meet your heating needs. All Pacific Energy Ltd. wood burning inserts include blowers and a variety of finish options including porcelain enamel, cast iron facades & trims in gold or nickel. Pacific Energy Ltd is an industry leader when it comes to steel wood burners which have a lifetime warranty – the industry’s best warranty! (Please scroll to the bottom of the Pacific Energy LTD web page to view inserts). You no longer have to compromise on aesthetics to improve the efficiency of your wood burning masonry fireplace. With the Volcano Plus, you get both. 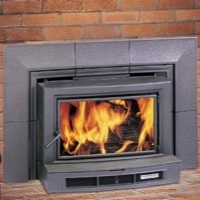 This unique EPA approved fireplace insert combines elegance with extreme performance. Recognized as one of the largest inserts in the industry, the Volcano Plus can heat vast areas of your home even without the use of its blowers during the coldest winter days. With its unique design and patented air control, it is no surprise that the Volcano Plus was voted by our Dealers as the most innovative and best selling product of 2010. Not just a Cast Iron promise for a modern lifestyle… Danish wood stove innovator Morsø has yet another great product in its extensive range of cast iron wood burning stoves and inserts. Hearthstone is best known for their use of soapstone in their wood stoves. Soapstone is a heat sponge – soaking up heat and releasing it slowly into your room in soft waves of heat. This happens the same way in their soap stone lined all cast iron wood inserts. Two sizes with two different sized surrounds, the Hearthstone wood inserts, Morgan and Clydesdale, have reversible doors and feature optional blowers and screens. These units can sit out on your hearth or flush with the face of the surround. You’ll love watching the flames jump and dart while you enjoy the “soft” comfortable heat only a Hearthstone stone lined insert will deliver!